HomeTravelThere Are No Real Roads in Guadalupe Park. You Earn the Incredible Views. July 23, 2018 Paul Travel Comments Off on There Are No Real Roads in Guadalupe Park. You Earn the Incredible Views. On our last morning, a funny thing happened on the way to the park. Because the Pine Springs campsites had filled quickly for the weekend, we had been happily ensconced at the Hotel El Capitan, in Van Horn. It was an hour’s drive away, but the commute gave me time to plot each day’s itinerary — and to fall awe-struck anew each time the Guads rose into view from the highway. (And, since the park is just within the Mountain time zone, we would arrive each morning at the same time as when we’d left the hotel.) We had our sights set on conquering Guadalupe Peak, but as I flipped through my notes, I began to realize something. I’d asked just about everyone we’d met — rangers, volunteers, friendly strangers — what their favorite parts of Guadalupe were. Not a single person mentioned the hike that everyone comes here to do. 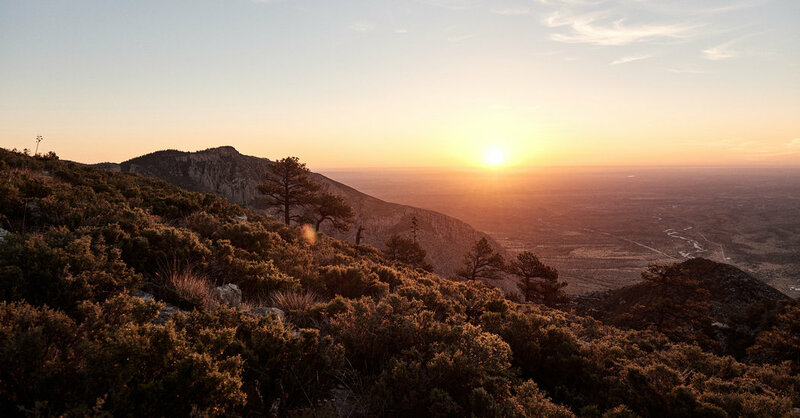 Guadalupe Peak may be the hook that draws visitors in, but it’s just the tip of the park’s sublime iceberg. One route recommended repeatedly was the nearly nine-mile loop through the Bowl, the alpine island in the sky, to Hunter Peak (at 8,377 feet, merely the sixth-highest in Texas). The vistas, we were assured, were even more stunning, plus we wouldn’t have to do any backtracking (though we would have to trudge up one of the steepest grades in the park) and it was far less trafficked. By all accounts, it would be more bang for our buck. I queried the park ranger on duty at the visitor center: Was there any convincing reason we should hike to Guadalupe Peak instead? “Well, you would have that accomplishment,” she said. I could collect my “top of Texas” medal another time. We were off to the Bowl. The march up Bear Canyon, basically a two-mile StairMaster session in full sun, was as grueling as we’d been warned it would be. When we were nearly to the top (or so I kept telling myself), a sonic boom rippled through the air, momentarily interrupting the birdsong echoing off the canyon’s upper reaches. And then, another one. About 35 miles away, Jeff Bezos’ suborbital Blue Origin “space vehicle” and its rocket booster had landed on the Amazon billionaire’s West Texas ranch after another successful test launch. We continued our own mission skyward. After roaming through the Bowl’s shallow, secluded valley (we’d see only one other hiker all day), we ascended one more rocky staircase to get to the top of Hunter Peak. There were hundred-mile views of the park’s “greatest hits” in every direction: We could see the gypsum dunes shimmering on the desert floor, the 45,000-acre relict forest just behind us, El Capitan’s noble profile and, rising above it all, Guadalupe Peak. As we made the long descent, I found myself fixating on the contradictory meanings of the phrase “it’s all downhill from here.” Going down proved no easier as we tested fears both known (my husband got to see a rattlesnake’s tonsils) and previously unidentified (I started to panic along several no-margin-for-error precipices). And even though we had been told, insistently and many times, to bring at least a gallon of water per person, we had brought two-ish gallons and ran out less than halfway through. Such a rookie mistake. That evening, after eight hours and four minutes on the trail, as we limped back into the hotel, we passed the Blue Origin team. They were gathered around the courtyard’s fountain, drinking celebratory beers, seemingly as giddy with relief as we were to have made it back down in one piece. In the early ‘70s, there was talk of installing a tramway that would take visitors to just below Guadalupe Peak, allowing many more people to revel in the beauty of the lesser-seen high country. The plan was ultimately scuttled. This would be no theme park. It’s a wilderness park. And long may it remain. Jordan Breal is a writer based in Austin, Tex. Her last article for The New York Times was about the Padre Island National Seashore along the Texas coast.